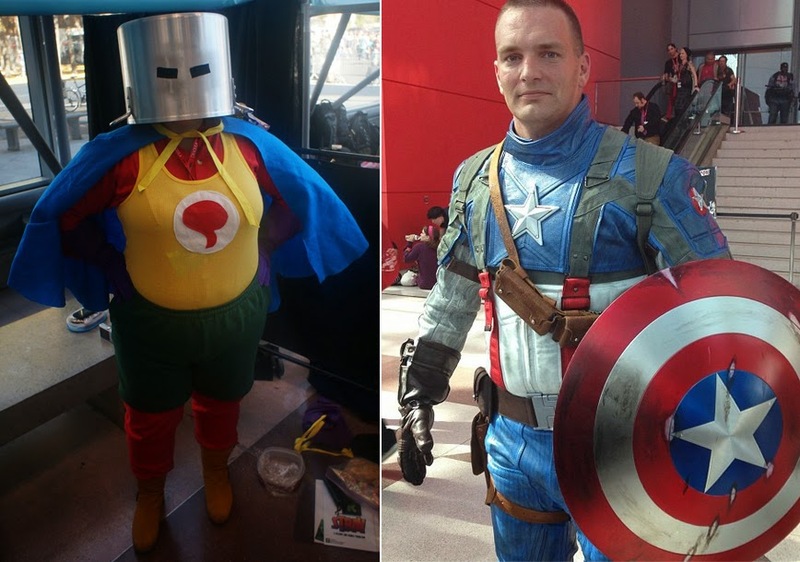 With attendance numbers even larger than the year before, NYCC 2013 had an influx of cosplayers to match. Deadpools by the hundreds, Batmans by the thousands, all out to make the day their own. This week, Now Comes The Cosplayer tips its hat to the good, the bad and the adventurous that made the day so memorable. Judging by the size of those skulls, Mystique looks like she murders smurfs (while the survivors are hiding in Mysterio's boxers). Still, these three show be you supervillain or Superman's cousin from another dimension, platform high-heeled shoes will always save the day. I can't seem to tell who is having the most fun, but it would be great to have these two follow each other for a bit, just to watch the crowd do a double take! Ol' DC52 reboots sure do turn heads! Speaking of DC, I doubt the original Red Tornado is going to be pulled over into the new era, but I love that someone digs the JSA enough to cosplay the character! Meanwhile, is that not one of the best Captain America's out there? 3 out of 4 HYDRA operatives say 'yes'. Does anyone else see Cameron Diaz in this lady? No? Just me? Well alright then. Easily one of the most show-stopping costumes of this year's 'Con, Starfire here probably racked up a few new subscribers to Red Hood and The Outlaws all on her own! What do you think? For an extra cool Spidey, visit the IADW Facebook page here. To drown in cosplay overload, view the galleries these images were sourced from, here, here, and here. Somebody did a lot of work on that Captain America outfit. Incredibly authentic, looks amazing. I'll say Comicsfan, he looks like he just stepped off a Quinjet! Thanks for the comments! I see a little bit of Cameron Diaz in her face, sure. The Power Girl cosplay looks good but OH! that Wonder Woman fellow...makes me quite ill at ease! He gets points for bravery Karl - that's for sure!